McMurry senior Samantha Ritz (Rowlett, Texas) went 2-0 at No. 1 singles and doubles in the War Hawks’ wins over Concordia Texas and Mary Hardin-Baylor. Ritz earned a 6-3, 7-6 victory over the Tornados and 6-0, 6-0 win against the Cru. In doubles, she teamed with Kaitlyn Roberts for both wins. It is Ritz’ second career Player of the Week award. 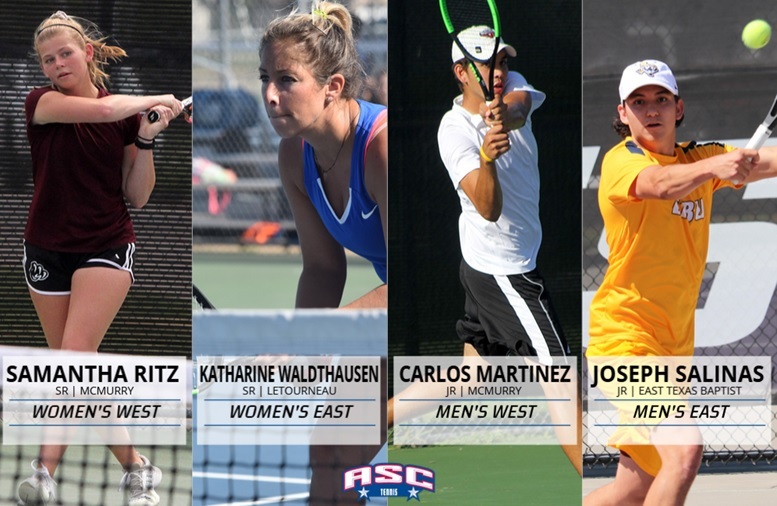 LeTourneau senior Katharine Waldthausen (Konigstein, Germany) went 4-0 on the week at No. 1 singles and doubles for her second Player of the Week award of the season. She defeated Ozarks 6-1, 6-4 and UT Tyler 7-6 (7-5), 6-3 in singles and teamed with Maddison Brackenreg for an 8-1 victory over the Eagles and an 8-5 win against the Patriots. McMurry junior Carlos Martinez (Monterrey, Mexico) went 2-0 at both No. 1 singles and doubles for the War Hawks. He was responsible for both points in a loss to Concordia Texas, winning 6-7, 6-3, 10-3 in singles and 8-2 with partner Chase Daniell. Against Mary Hardin-Baylor, Martinez won 6-0, 6-1 in singles and 8-0 in doubles for his second career Player of the Week honors. East Texas Baptist junior Joseph Salinas (Deer Park, Texas) won the tiebreaker in set one in singles and then came away with the 6-2 win for a singles point against Ozarks. He also won 8-1 at No. 2 doubles with Ty Tarver in the 8-1 win over the Eagles. It is Salinas’ second career Player of the Week award. Hardin-Simmons junior Abigail Kendall (Belton, Texas) won a pair of matches at No. 2 singles including a 6-0, 6-0 win over Mary Hardin-Baylor and 3-6, 7-6, 6-4 over Concordia Texas. She also teamed with Kyra Mobley for a pair of wins at No. 1 doubles. UT Tyler freshman Brooke Brewer (McKinney, Texas) won at No. 4 singles against LeTourneau 6-2, 6-1 and teamed with Alexandra McKissick for an 8-5 victory at No. 2 doubles against the YellowJackets. UT Dallas senior Sophie Farmer (Eden Prairie, Minn.) was perfect in both singles and doubles as the Comets locked down their second straight ASC West title last week and secured the right to host the ASC Tournament for the first time in program history. She and partner Elizabeth Labra defeated Sul Ross State’s No. 2 doubles squad 8-0 as the Comets collected their fifth straight ASC West shutout on Friday. Farmer later earned a 6-3, 7-5 win at No. 4 singles in Sunday’s 9-0 home win over Austin. East Texas Baptist senior Kaleigh Smith (Greenville, Texas) won the tiebreaker in the second set to gain a 6-0, 7-6 victory against Ozarks at No. 4. She also teamed with Olivia Parmelly for an 8-3 doubles victory at No. 1 against the Eagles. Mary Hardin-Baylor senior Alex Mackellar (Belton, Texas) was unbeaten in singles and doubles last week. His wins at No. 3 doubles and No. 5 singles accounted for two of the Cru’s four points in a 5-4 loss to Hardin-Simmons. He won in straight sets at No. 6 singles to clinch the match win over McMurry. He also teamed with Brian Martin for a win at No. 3 doubles in that match. Hardin-Simmons senior Griffin Weinkam (Frisco, Texas) had another whole week in ASC action as he won both of his No. 3 singles matches at Concordia Texas and Mary Hardin-Baylor. He also teamed with Holt Fields to win both matches at No. 2 doubles. UT Tyler sophomore Jose Cuerra (Bogota, Colombia) went 2-0 in singles and doubles play on the road Friday. He earned a 6-0, 6-0 win at No. 4 singles over Louisiana College and a 6-3, 6-2 win at No. 3 at LeTourneau. Cuerra teamed with Daniel Rodriguez for wins at No. 2 doubles over both teams. UT Dallas junior Ashwin Vaithianathan (Highlands Ranch, Colo.) was perfect in both singles and doubles as the Comets posted a 3-0 record last week to improve to 12-1 on the spring. Vaithianathan picked up singles wins at No. 3 in both of UTD non-conference matches, earning a 6-3, 6-2, win in the dual with Dallas Baptist Thursday, and a 7-6, 6-4, win in the Comets’ home win over Austin Friday. He added a pair of doubles wins with partner Haydn Steffes at No. 2 in both those contests. LeTourneau junior Christian Farris (El Paso, Texas) capped off a perfect 4-0 mark in ASC play in both singles and doubles action by picking going 2-0 against conference opponents to help the YellowJackets secure an outright ASC East Division Title. For the week, Farris was 2-1 in No. 2 singles play and 3-0 with Jimmie Henson at No. 1 doubles. Concordia Texas freshman Evan Pena Jr. (Rio Grande City, Texas) won all four of his matches as the Tornados picked up wins over McMurry and Hardin-Simmons last week. Against the War Hawks, Pena Jr. and doubles partner Adam Compton pulled out a 9-7 win at line three. Pena Jr. followed it up with a dominating performance at line four singles, shutting out his opponent. UT Tyler sophomore Damarion Greenwood (Jacksonville, Texas) broke the Patriot record in the 400-meter hurdles with a time of 55.41 seconds, placing sixth at the East Texas Invitational in Commerce. His time also ranks 35th in the nation. Greenwood also ran the 110 hurdles in 15.69, placing sixth and cleared the high jump of 1.90 meters (6 ft.-2.75 in. ), finishing third. 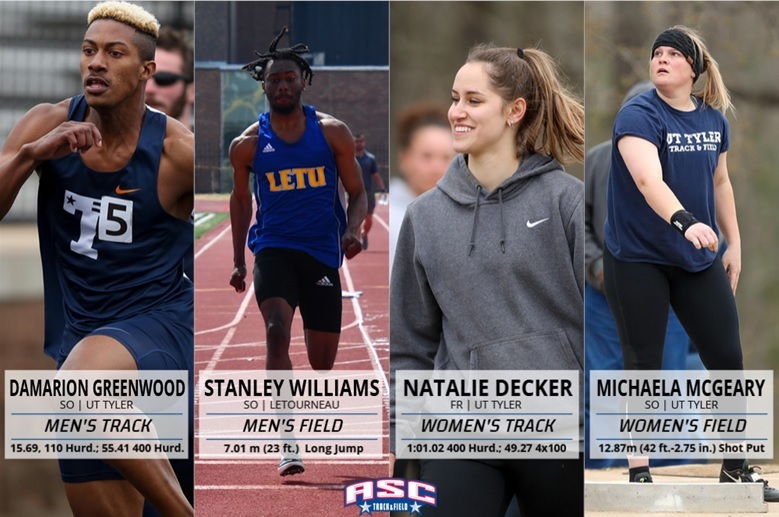 LeTourneau sophomore Stanley Williams (Commerce, Texas) set two school records and be part of a third record-setting performance at the East Texas Invitational for the YellowJackets. The weekend would start with Williams taking third in the long jump with a mark of 7.01 meters (23 ft.) to take third with the 16th-best mark in NCAA Division III this season. Williams would go on to run a time of 11.03 in the 100 meters and be part of the 4×100 relay team that ran a time of 42.98. UT Tyler freshman Natalie Decker (Houston, Texas) ran the 400-meter dash in 1:01.02 at the East Texas Invitational, placing 11th at the East Texas Invitational. Her time also ranks 20th in NCAA Division III. Decker was also a part of the 4×100 meter relay team that placed fifth in 49.27 seconds and ranks fifth in the country. She also broke her school record and won the high jump, clearing 1.60 meters (5 ft-3 in.) to earn her third Athlete of the Week award of the season. UT Tyler sophomore Michaela McGeary (Woodsboro, Texas) broke the school record with a shot put of 12.87 meters (42 ft.-2.75 in. ), winning the event at the East Texas Invitational. Her mark ranks 31st in the nation. She also placed third in the hammer throw at 45.70 meters (149 ft.-11 in. ), ranking fifth in the South/Southeast Region and was sixth in the discus at 39.58 meters (129 ft-10 in. ), which is sixth in the region. It is McGeary’s second Athlete of the Week award of the season. UT Tyler sophomore Daulton Coleman (Apple Springs, Texas) finished second in the hammer throw at the East Texas Invitational with a mark of 49.93 meters (163 ft.-10. in.). He also had a javelin throw of 41.53 meters (136 ft.-3 in. ), placing fourth. Hardin-Simmons junior Tanner Wright (Fort Worth, Texas) placed fourth at East Texas Invite with a long jump of 6.99 meters (22 ft.-11.25 in. ), which is 20th in the NCAA Division III. Ozarks sophomore Michael Harris (Elkins, Ark.) set a new program record in the 5,000 meters Friday night at the UCA Open. He finished second overall running a 15:36.63 which ranks 31st in the South/Southeast region. East Texas Baptist sophomore Mack Broussard (Hankamer, Texas) won the 10,000-meter run in 32:33.70 at the UCA Open in Conway, Ark. His time was two minutes faster than the second place finisher. He then was four seconds off of first place in the 1,500-meter run with a 4:08.90 but came in ahead of runners from NCAA Division I, II, III, NAIA, and NJCAA with 26 participants. East Texas Baptist freshman Anthony Gipson (Inglewood, Calif.) was fifth out of 18 participants in the long jump at the UCA Open. His 6.31 meters (20 ft.-8.5) was less than a foot off of the winner. LeTourneau junior Rebekah Stevenson (Conroe, Texas) set a school record in the hammer throw at the East Texas Invitational by recording a mark of 40.58 meters (133 ft. – 1 in.) to take sixth in the 15-person event. The score was over six feet better than the previous school record and currently ranks 20th in the NCAA Division III South/Southeast Region. East Texas Baptist freshman Grace Almond (Coushatta, La.) cleared 1.42 meters (4 ft.-7.75 in.) in the high jump to tie for third place at the UCA Open. East Texas Baptist freshman Almalisseth Rodriguez (Houston, Texas) finished fifth in the 5,000 meters in 19:43.14 at the UCA Open. East Texas Baptist senior first baseman Landen Barns (Cypress, Texas) hit .583 (7-for-12) with a double, triple, nine RBI and three runs scored as the Tigers swept Sul Ross State on the road. In an 11-7 come-from-behind win in the opener, he was 3-for-6 with four RBI and scored the go-ahead run in the sixth inning. Barns was 2-for-2 with two runs scored, a double and five driven in Saturday’s 18-8 finale. 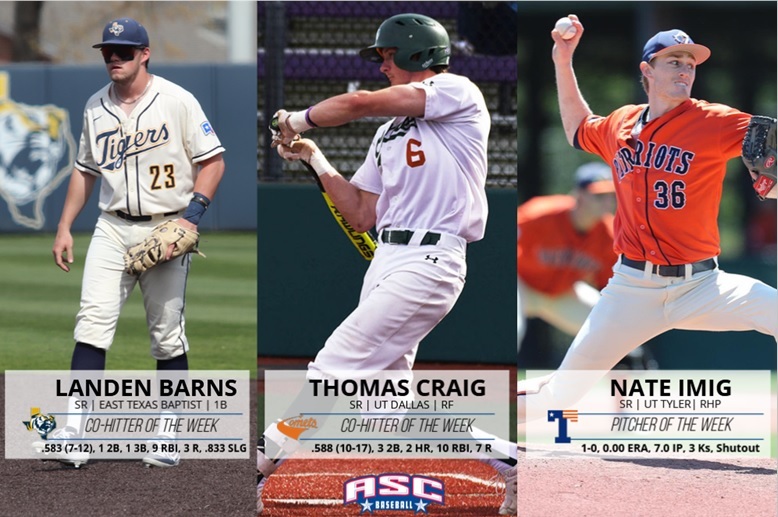 UT Dallas senior right fielder Thomas Craig (Austin, Texas) went 10-for-17 from the plate as he sparked the Comets to a 4-0 record last week, extending UTD’s current winning streak to eight straight games. Craig opened the week by going 3-for-5 with a pair of doubles Wednesday night in a 10-3 non-conference road win over Austin. He had three RBI and scored a run in the win. Craig followed up by going 7-for-12 with two home runs and another double over the weekend in a three-game road sweep of McMurry. Over the three games, he picked up seven RBI and scored six runs. In Sunday’s series finale, Craig went 3-for-5 with four RBI, collecting a double and his team-leading eighth home run of the season in a Comets’ 15-11 win. It is Craig’s second Hitter of the Week award of the year. UT Tyler senior right-hander Nate Imig (Leander, Texas) threw a seven-inning, complete game shutout against Ozarks in a 6-0 win on Friday. Imig fanned three, allowing just two hits with no walks. LeTourneau freshman shortstop Kyle Guevara (Diboll, Texas) had a career week at the plate going 6-for-12 (.500) through four games with one double, seven total bases and a team-high five RBI. Guevara had a team-high two hits in game one of the YellowJackets series against Howard Payne while also driving in the game-winning run in extra innings. UT Tyler senior third baseman Blake Wilson (Midlothian, Texas) set the Patriots’ career record for hits and games played in as they went 3-0 during the week. He hit .545 (6-for-11) with a double, triple, five RBI, four runs scored and a .818 slugging percentage. Hardin-Simmons junior left fielder Cade Johnson (Tuscola, Texas) had five extra-base hits, including a pair of home runs, as the Cowboys went 4-1 on the week. He scored four times and drove in seven runners on the week while hitting .412 (7-for-17). Louisiana College senior first baseman Dane Pedersen (Slidell, La.) went 7-for-11 (.636) with a double and a home run and three RBI in the series at Hardin-Simmons. His three-run homer tied the game in the series opener, and he turned in a 4-for-4 day with a double in the No. 29 Wildcats’ extra-inning 6-5 come-from-behind victory in game three. McMurry junior third baseman Sam Hillyer (San Antonio, Texas) hit .545 (6-for-11), posting hits in all three games against UT Dallas. He had four RBI in game one with two sacrifice flies. He also scored three runs in the second game and hit a solo homer in the finale. For the weekend, Hillyer recorded five RBI and six runs scored. Howard Payne senior center fielder Noah Payne (Humble, Texas) reached base six times and scored five times while hitting .300 (3-of-10) with two stolen bases in the three-game series against LeTourneau. Concordia Texas senior second baseman Carson Cox (Cotulla, Texas) hit .600 (6-for-10) with a double, triple, three RBI, three runs scored and two steals as the No. 26 Tornados swept Belhaven. He had at least a hit in all three games. In a 7-0 shutout of the Blazers on Friday, Cox tallied two hits, scoring twice and driving in a run, but saved his best for last, going 3-for-4 from the plate from the finale, including a triple, scoring a run and an RBI. Ozark’s junior designated hitter Chase Edwards (Chandler, Ariz.) hit .428 (3-for-7) in a doubleheader against UT Tyler. Mary Hardin-Baylor sophomore catcher Hunter McQuary (Magnolia, Texas) had two of the Cru’s hits in a 6-3 loss to No. 4/5 Trinity. LeTourneau freshman right-hander Raul Martinez (Tyler, Texas) appeared in three of the YellowJackets’ four games this week, tossing five complete innings. He gave up just three hits and allowed zero earned runs, finishing the week with a 0.00 ERA and 1-0 record. Martinez struck out five batters and held his opponents to a .176 batting average. Ozark’s senior righty Dalton Spurgeon (Lee’s Summit, Mo.) allowed one earned run over four innings with a pair of strikeouts in his start against UT Tyler. Louisiana College senior right-hander Phillip Vidrine (Ville Platte, La.) made two relief appearances in the series at Hardin-Simmons, earning the decision in both appearances going 1-1. He threw 6.1 innings, allowing one earned run on six hits with five strikeouts. He pitched 3.2 innings of scoreless work in the bottom of the ninth or later as the No. 29 Wildcats picked up the 6-5 extra-inning win. Howard Payne senior righty Chandler Clark (Robinson, Texas) had a great start on the mound for the Yellow Jackets, firing six strong innings in a no-decision. He only gave up four hits with two unearned runs and three strikeouts. East Texas Baptist senior right-hander Chad Boudreaux (Spring, Texas) made two relief appearances, earning a win the 11-7 opener by throwing the final two innings. He fanned two batters in two shutout innings. In Saturday’s 7-4 victory, Boudreaux pitched two innings, striking out four. Concordia Texas junior righty Taylor Barksdale (Burnet, Texas) tossed five no-hit innings in Saturday’s series finale as the No. 26 Tornados went on to run-rule Belhaven 12-2. Barksdale would strike out five batters on the day not allowing a single hit before being pulled in the sixth, earning his fifth win of the season. UT Dallas junior right-hander Logan McPherson (Springtown, Texas) picked up two saves as he closed both ends of a doubleheader sweep of McMurry on Friday. McPherson pitched the seventh inning in the series opener with the War Hawks, giving up one run on two hits with a strikeout in a 7-6 win. He then had a 2.1-inning save in the second game of the day, an 11-9 Comet victory, striking out three while giving up one earned run on two hits. Mary Hardin-Baylor junior left-hander Aaron Edelmon (Georgetown, Texas) gave up four hits and two earned runs in four innings in a loss to No. 4/5 Trinity. He struck out four and walked just two. UT Tyler senior right fielder Nicole Garcia (Sugar Land, Texas) hit .722 (13-for-18) with three doubles, a home run, five RBI, five walks, 12 runs scored and three steals as the Patriots swept both Concordia Texas and Howard Payne to go 6-0 on the week. Garcia went 4-for-5 with a double in two runs in an 8-0 win over the Tornados to open the week. She was 2-for-2 with a pair of runs, three driven in, a double and a homer in an 8-0 victory against HPU. It is Garcia’s third Hitter of the Week of the season and fourth of her career. 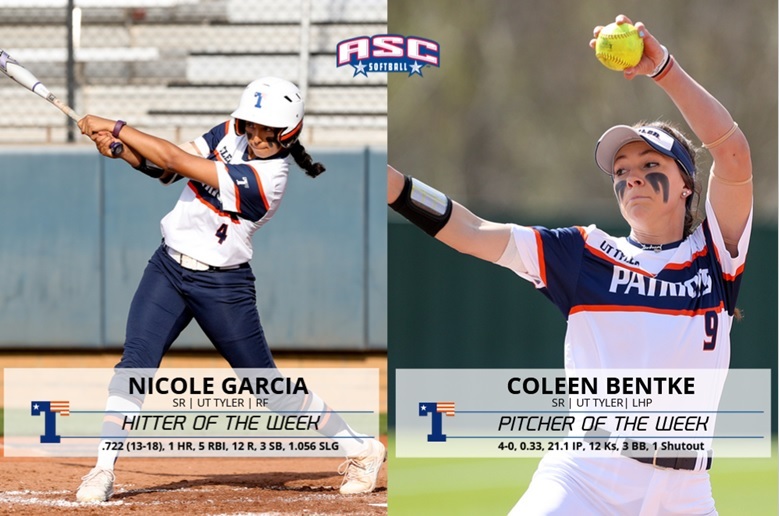 UT Tyler senior left-hander Colleen Bentke (Brenham, Texas) went 4-0 with a 0.33 ERA and 12 strikeouts over 21.1 innings as the Patriots swept both Concordia Texas and Howard Payne. She allowed just three walks, 13 hits, and one run and recorded one complete game shutout and pitched and started two others. It is Bentke’s fourth Pitcher of the Week award of the season and sixth of her career. Mary Hardin-Baylor senior second baseman Kasi Cummings (Grandview, Texas) helped the Cru to a 3-2 week with a series sweep over Sul Ross State. Against Southwestern early in the week, Cummings totaled three hits with one run scored. She followed that with four hits and two runs scored against the Lobos, including a 10th-inning game-winning RBI in UMHB’s 4-3 win and the winning run in the Cru’s 3-1 victory. Cummings totaled three extra bases hits and did not strike out in 17 at-bats. She hit .418 on the week, recording a hit in all five contests. LeTourneau senior catcher Macey Mize (Waco, Texas) hit .455 (5-for-11) in the YellowJackets’ three-game sweep over UT Dallas. Mize recorded one double and one home run for a .818 slugging percentage while tallying a team-high nine total bases and five runs scored on the weekend. She also added three stolen bases. Ozark’s junior third baseman Sydney Key (Lamar, Ark.) hit .571 (4-for-7) with three doubles in a double-header against Hendrix College. Key owned a 1.000 slugging percentage and drove in four runs over two games. McMurry junior shortstop Mikayla Krause (DeLeon, Texas) hit a walk-off grand slam in the 9-5 series finale against Louisiana College on Sunday. She was also 2-for-3 with a double and an RBI in an 11-3 win on Friday. For the week, Krause drove in five runs with three scored. Louisiana College senior outfielder Alyssa Ross (Pearl River, La.) went 6-for-11 (.545) at the at McMurry at the top of the Wildcat lineup. She had a double and two triples to her credit, scored five runs and went 3-for-3 on stolen bases. She hit a triple in back-to-back at-bats in the second game of the series. UT Dallas senior right fielder Amber Williams (Kilgore, Texas) went 5-for-9 (.556) from the plate and drew a pair of walks for the Comets in their three-game road series at LeTourneau over the weekend. Williams picked up two doubles and scored two runs in the set. East Texas Baptist sophomore left fielder Daniella Solis (Baytown, Texas) hit .667 (6-for-9) with a double, two home runs, three RBI, three runs scored and a 1.444 slugging percentage in the No. 2 Tigers’ series at Hardin-Simmons. She went 4-for-4 with two RBI in Sunday’s series finale against the Cowgirls. Hardin-Simmons freshman shortstop Kenzee Hessert (Royse City, Texas) hit a two-run walk-off home run in Sunday’s 10-8 win over No. 2 East Texas Baptist. In the series against the Tigers, she hit .455 (5-for-11) with a double, triple, homer, three RBI and two runs scored. Mary Hardin-Baylor freshman right-hander Bayleigh Grogan (Wimberley, Texas) made three starts on the week for the Cru, taking a loss to Southwestern before earning back-to-back wins over Sul Ross State. Grogan totaled 16.1 innings of work with six runs allowed. She shut out the Lobos in the final game of the series, allowing Sul Ross just one total run scored. LeTourneau freshman righty Bailey Richey (Houston, Texas) appeared in two of the YellowJackets’ three wins over UT Dallas, holding the Comets to a .263 batting average in 9.1 innings of work. Richey threw a complete seven innings in game one, allowing just six hits and one run while adding four strikeouts, leading the YellowJackets to a 2-1 victory. She finished the weekend with a 2.25 ERA and a 1-0 record. Belhaven junior right-hander Kassie Shipley (Winnsboro, La.) threw back-to-back complete-game victories against Concordia Texas with a 2.50 ERA and one strikeout. East Texas Baptist freshman righty Beatriz Lara (Orange Grove, Texas) earned a five-inning shutout in game one, 8-0, with seven strikeouts and allowing just four hits at Hardin-Simmons. She started game 3 and went 3.2 innings with seven Ks. Overall she had 14 strikeouts and earned another shutout on the year. ASC Women’s Golf – UMHB Claims 12th Title in Women’s Golf. 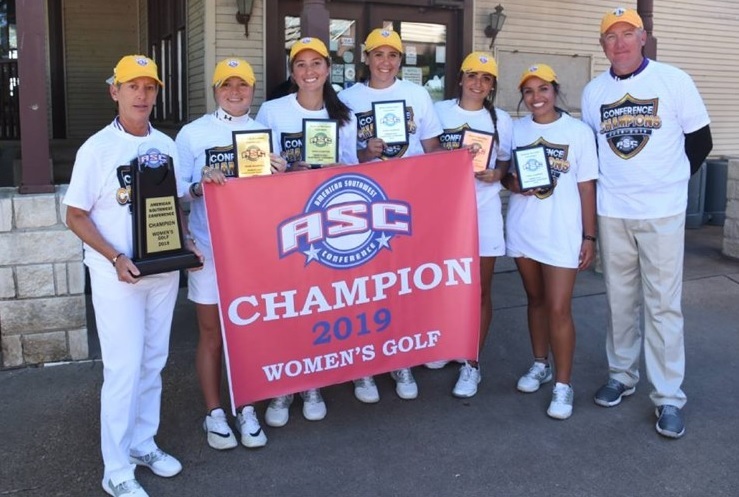 GLEN ROSE, Texas – Mary Hardin-Baylor led in all three rounds of the 2019 American Southwest Conference Women’s Golf Championship to claim its 12th title in the sport at Squaw Valley Golf Course. The Cru shot a 316-325-312=953 to win the tournament by 21 strokes over runner-up Concordia Texas, who shot a 974. The 2019 Championship was the first 54-hole event for the women in the 21-year history. UT Dallas finished in third with a 977, followed by Hardin-Simmons at 996 and East Texas Baptist at 997. Individually, UMHB junior Olivia Robinson was the individual medalist with a 74-78-72-224. The ASC Golfer of the Year was +8 for the tournament and shot even par in the final round. Following her was Concordia Texas’ Madyson Milliorn (230), Lindy Patterson (231) and Marissa Langer (241) of UT Dallas, Victoria Gleghorn (241) of UMHB and Elizabeth Hardy (241) of ETBU to make up the All-Tournament Team. The Cru earn the ASC’s automatic qualifier to the NCAA Division III Women’s Golf Championship at Bay Oaks Country Club in Houston May 14-17. The full field announcement is on Monday, May 6 on NCAA.com. GLEN ROSE, Texas – Mary Hardin-Baylor junior Olivia Robinson was named the 2019 American Southwest Conference Golfer of the Year to highlight the All-Conference teams and individual awards. The honors were presented after the 2019 Women’s Golf Championship at Squaw Golf Course on Sunday. 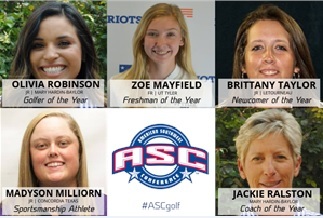 Robinson, who was the medalist at the 2019 ASC Women’s Golf Championship, led the conference with a 77.3 scoring average during the regular season. Selected the Freshman of the Year was Zoe Mayfield of UT Tyler. She ranked third in league with a 78.4 stroke average. LeTourneau junior Brittany Tylor was the Newcomer of the Year, and Concordia Texas junior Madyson Milliorn was voted as the Sportsmanship Athlete of the Year. Milliorn finished as the runner-up at the ASC Championship. Jackie Ralston from Mary Hardin-Baylor was named the Coach of the Year. Ralston guided the Cru to three tournament wins, including the 2019 ASC Women’s Golf Championship. Robinson was one of five three-time All-Conference selections. Heidi Moser So. Hardin-Simmons Henderson, Nev.
Claire Oetinger Fr. UC Santa Cruz Yosemite, Calif.